The theory of tariffs, the most fertile field of economic speculation in the days of the classical economists, has for some time lain barren. 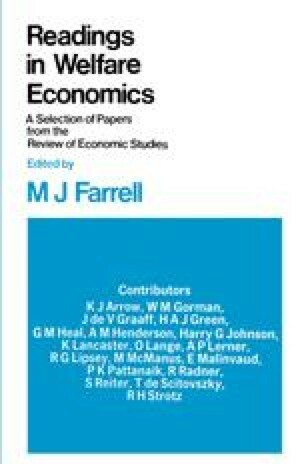 Historically, it was the origin of the modern subjective theory of value (in the doctrine of comparative costs), it was earliest in emphasising the importance of demand in determining relative prices (J. S. Mill’s reciprocal demand), and it has provided the analytical tools, Marshall’s offer curves, from whose application to the problem of exchange between persons the general theory of perfect competition has been developed. Unfortunately, however, the analogy between countries and persons was considered irreversible. Our theory of the individual’s rational economic behaviour was not applied to problems of international trade because of our supposed inability to draw community indifference curves. Hence, we have no theory of the rational behaviour of a single country, and even less do we know what would be the result of such behaviour on the part of all countries. I propose to give this name to that part of the theory of international trade which deals with the problem of tariffs and the gain from trade. We shall not be concerned here with the problem of international capital transfer. I am indebted to Miss Anne M. Aickelin for her valuable suggestions concerning the presenta- tion of this article and for much of the reasoning and results of sections VI and VII.